Our pony Sparky has a case of minor scratches on his hind feet, a fairly odd occurrence in Wyoming in July. We’ve had enough rain, coupled with hosing a wound on his hock, that now we have another small problem to doctor on him. 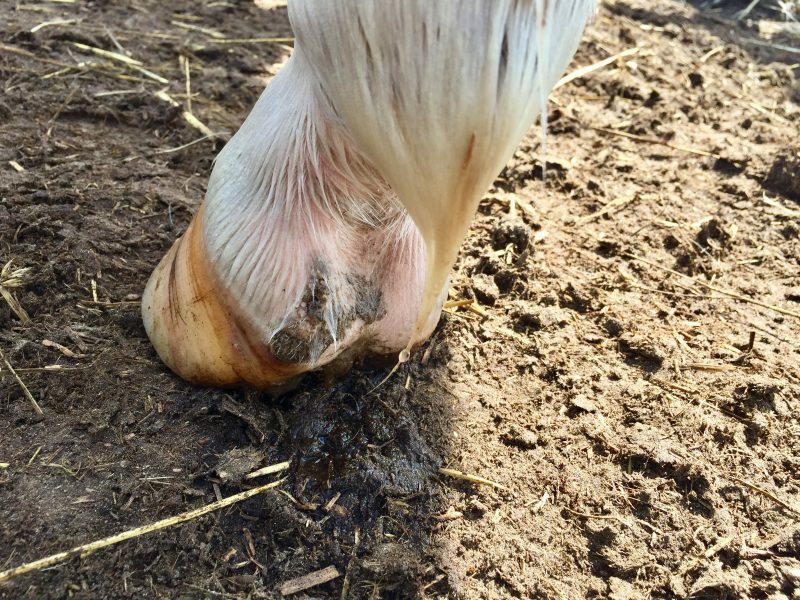 Scratches, also known as mud fever, pastern dermatitis, dew poisoning, or greasy heel, is a skin condition caused by viral, bacterial, fungal, or parasitic infections. It often shows up on light-colored or white legs, and is typically a black, crumbly, cluster. I don’t care to pick scratches off, rather, I let it dry out and apply either Corona or Miracle Heel. If it looks like it needs to be washed due to a presence of mud or excessive dirt, it can be, but if it’s clean, I usually let it dry out and reapply an ointment. If the horse affected with scratches has feathering on his feet, you may need to trim or clip it to prevent moisture from staying in the affected area. Removing your horse from muck and moisture is the best thing for scratches, but if the horse can’t be removed from moisture, it’s helpful for the scratches area to have an ointment applied and wrapped with vet wrap and duct tape. The key is to let it dry out, so being out in the air, dry-lotted is best. Horses that are infected with scratches don’t typically need a visit to the vet, but if you notice swelling, heat, or pain, you should consult your vet.